The German language is like coffee. It tastes bitter at first, but it’s incredibly addictive. To the English ear, it is not the most beautiful of European languages. But at least it has some bite! 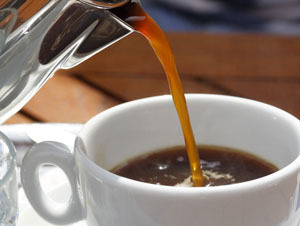 This authentic picture of German coffee is provided by Research in Germany. My grandfather was German and I was familiar with the sounds of German before I ever studied the language. I had the rare chance to learn German in an American high school, and it changed my life. German opens whole new worlds of opportunity, not only for engineers and business people but also for scholars and musicians! Still, it was not until I moved to Austria (at the age of 20) that I realized that German could be habit-forming. Gutteral sounds are not the most pleasing to hear, but they are extremely satisfying to say! And if you crave elegance, you can find it in German’s pure, round vowels. Best of all, the explosive consonants give the listener a special rhythmic pleasure that is absent from, say, French. German snaps and crackles and pops! In my first few months in Salzburg, I let the German language seep into every corner of my mind. I limited my contact with my English-speaking friends and insisted on only speaking German to my professors and colleagues. All of my courses at the Mozarteum were taught in German and the lingua franca of the cafeteria was German. My brain adapted to my personal linguistic experiment. By the end of my third year in Austria, I was thinking and dreaming in German. The wonderful thing about thinking in a different language is that you start to think in different directions. You can’t help but have new creative insights! This happens automatically when you use a different word order, or express your feelings with a different metaphor, than you would have used in your own language. You start to see things differently, not just from a different cultural perspective, but from a different linguistic perspective, as well. My parents were a little alarmed when I first came home for vacation and had to search for English words. But it provided a lot of spontaneous humor at the dinner table. Naturally, the brain adapts (again!) very quickly to conversation in its native language. And all of this brain exercise is very healthy; recent studies indicate that people who are bilingual have higher cognitive function and better long-term brain health. Of course, I was studying music, and music has a way of getting under your skin. By singing German opera and German Lieder (art songs), I ensured that German would stay in my soul forever. There is a deep beauty in German Romantic poetry that has been set to music. Du holde Kunst, ich danke dir dafür! So why is German considered so difficult? It has a relatively small vocabulary, but a very sophisticated grammatical structure. 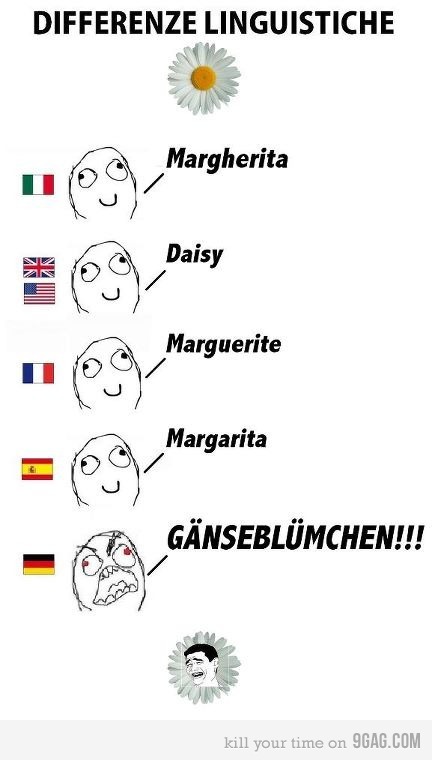 That’s why German is not the easiest language for an English-speaker to learn, even though English is a Germanic language. I made a ton of mistakes while learning German — and I still do! But now, I have a tender spot in my heart for German syntax. I even get nostalgic for the sound of the Austrian dialect. If I stay away from Austria for too long, I have to feed my German addiction by reading German novels and watching Austrian TV programs. You may have seen this chart on Facebook. It insinuates that German is not as pretty as other European languages. Which is true!!! But German has its own crackling energy. So be careful the next time that you pick up a German book, or start talking to a German friend. German is extremely addictive. You might just like it! A not-so-scary story about pumpkins, opera singers and church history. Holidays are fun. When I lived at International House in New York City, we made a point of celebrating every holiday in the world. This was not an attempt to be hyperpolitical or pantheistic, but just to truly appreciate every unique culture… and to make sure that life is a constant party! So I hope you’re having a happy Halloween. But I just have to ask: has anyone wished you a Happy Reformation Day today? Because 494 years ago today, Martin Luther nailed his 95 Theses to the door of the Schlosskirche in Wittenberg. And soon afterward, Huldrych Zwingli began working on the first German translation of the Bible in Zürich. These guys were radical Protestants. As the daughter of a church historian, I have a special place in my heart for these cool historical details. I can’t stroll through Zürich without thinking about all the other people who have walked on the same cobblestones — not only great composers like Honegger and Wagner, but also great theologians like Zwingli and Bullinger. So when I was invited to sing at the International Protestant Church of Zürich on Reformation Sunday, in the very church where Bullinger and the Huguenots worshipped, I was pretty stoked. I bought a train ticket and embarked on a “Reformation Road Trip” to Zürich! Of course, knowing too much about church history can make things awkward for a soprano. You see, Zwingli did not actually approve of having musical instruments in worship! He was an excellent musician himself, but he did not feel that it was appropriate in church. I disagree with Zwingli on that one (and so did Luther!) but I do admire the bold, exciting way that he loved Christ. So that’s what I tried to convey in my singing, even though we broke some of Zwingli’s rules by using that gorgeous organ. Since Huldrych was a bit of a rule-breaker himself, I hope he’ll understand. I returned home to Salzburg feeling very grateful that I’d had an opportunity to sing there. Protestants aren’t the only ones who are celebrating this week. There are some beautiful Catholic holidays coming up. In Austria, we will celebrate All Saint’s Day (November 1) and All Souls’ Day (November 2). Hermann von Gilm wrote a marvelous poem about All Souls’ Day (“Allerseelen”), set to music by Richard Strauss. So that’s my Halloween update from the Alps. I wish you a happy holiday. 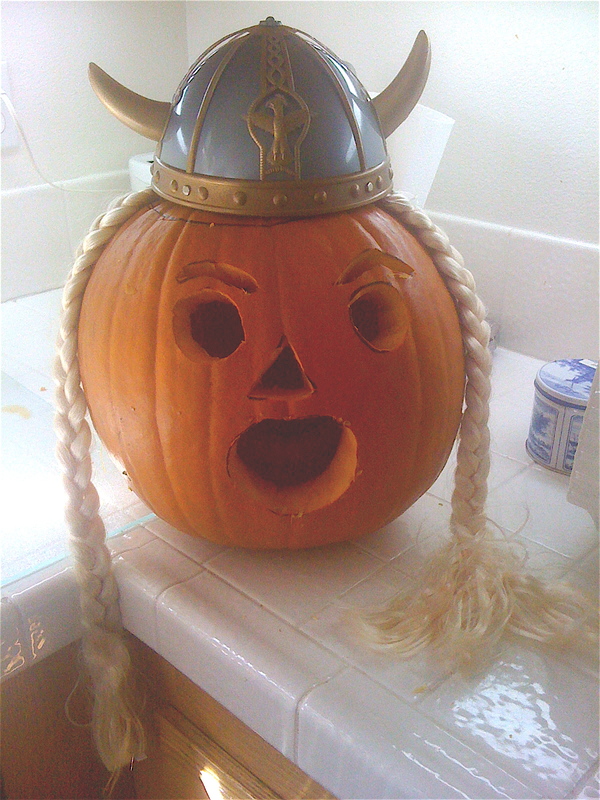 Just remember to watch out for singing pumpkins in pigtails. Auf Wiedersehen! It’s time to tackle a subject that is close to everyone’s heart: Swiss chocolate. After all, one of the great things about singing opera in Europe is having access to high quality chocolate, right? Chocolate — or “Schoggi,” as it’s called in Swiss German — is seriously delicious. Switzerland is famous for its chocolate. Ever heard of Sprüngli and Lindt? I have recently discovered an entire blog devoted to swiss chocolate — if you speak German, check out their yummy episodes of Chocolate TV! 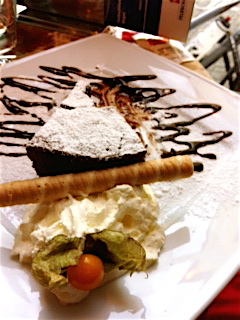 Today I enjoyed a tasty slice of Schoggikuchen at Café Odeon. I usually advise people NOT to eat at the riverside cafés in Zurich because it’s so incredibly expensive, but if you’re going to splurge, do it at Café Odeon. This legendary cafe has been frequented by some very famous patrons; when you slide into a booth, you may be sitting on the same red leather banquette used by Vladimir Lenin, Leon Trotsky, Franz Kafka, Mata Hari, Thornton Wilder, Benito Mussolini, Stefan Zweig, Bertolt Brecht, James Joyce or Albert Einstein! So you can contemplate all of that history while eating your chocolate cake. My Schoggikuchen cost me CHF 9, but it was worth it. Of course, not everyone is passionate about chocolate. If you’re more of a savory person, you’ll enjoy Tibits, a fantastic vegetarian restaurant near the opera house! But if you’re serious about sweets, you’ll appreciate Switzerland’s commitment to chocolate tourism. For a real taste of the chocolate empire, take the “Sweet Zürich” tour!